Current uses of clovers incorporate their fast, cool-season growth, their soil protection qualities, and their nitrogen-producing benefits. Advocates of sustainable agriculture will appreciate clover's economic advantages as a forage and green manure. Home gardeners will be interested to know that clover makes an excellent cover crop and soil builder during the winter months, returning large amounts of nitrogen to the soil through fixation and as the clovers are cultivated under as green manure. Crimson Clover will reward the flower gardener with a sea of bright red flowers if soil tillering is delayed until plants reach bloom stage. Clover's advantage is its economical price, and fast growth in cool weather. Clovers can also be used by home gardeners as well as private and public institutions in flower-bed areas. Growers will benefit from a high return of natural nitrogen, erosion control, excellent tilth, and a productive garden when clovers are used as a cover crop. Less commercial fertilizer will be needed as well. Highway planners will appreciate clover's beauty, rapid growth, easy maintenance, low profile (which requires no mowing), and soil building qualities for erosion control coverage on cut slope, fill slope and right of way plantings. Ampac supplies a wide range of clovers. For more information on availability, price, and planting information, please click here. A relatively new winter annual, Arrowleaf is finding increasing use as a naturally reseeding, long-season forage legume in southeastern states. It is successfully grown from eastern Texas to South Carolina, from Tennessee to the Gulf of Mexico, and in western Oregon. It thrives on sandy and clay soils but is less tolerant of acid soils and low fertility than Crimson Clover. Arrowleaf does not tolerate alkaline soils or poor drainage. Best soil to plant it in is fertile uplands and river bottom soils. Arrowleaf productive season is 6-8 weeks longer than Crimson. Has a high forage yield and a lower incidence of bloat. A high percentage of hard seed leads to considerable volunteering in succeeding years. The flower head is initially white, later turning pink to purple. The leaves are trifoliate, bearing a distinct white V-mark which resembles an arrowhead. 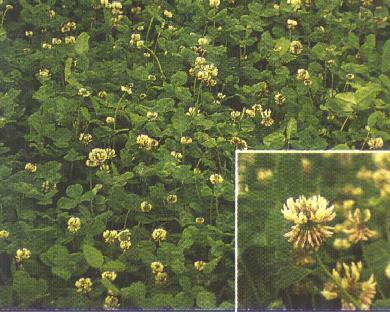 Gardeners and dry flower growers will find that this clover has excellent flowering characteristics. A winter annual normally planted in the fall for forage, cover crops, or garden flowering. In areas affected by severe cold weather, Crimson Clover can be planted in early spring and still attain desired growth and flowering, although maturity will be later. It grows vigorously on well-drained sandy or clay soils with medium-to-high fertility. It favors a neutral soil, but tolerates medium acidity. An early planting in the northern part of the U.S. (no later than August) allows establishment before extremely cold weather sets in. A fall planting is usual for most other areas. Crimson Clover is an important winter annual forage in the South, with growth continuing through winter. It thrives in a mixture with grasses, provides excellent winter grazing, and makes a good hay or cover crop. It is high in nutritive value when harvested in the pre-bloom stage. The flower heads are long, dark red (crimson). Crimson Clover makes an excellent cover crop for improving texture, organic matter and tilth of soils. 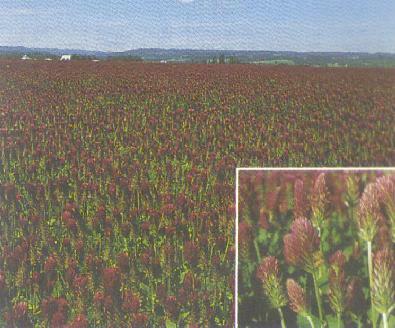 Crimson Clover will return to the soil as much as 100 lbs. of nitrogen per acre if cultivated under as a green manure. A short-lived perennial est suited for hay and silage in three and four-year crop rotations. It is also used for overseeding to fill in a thin cover. Fertile, well-drained soils of high moisture-holding capacity are best for Red Clover. Loams, silt loams, and even heavy-textured soils are preferred to light sandy or gravelly soils. It will grow on moderately acid soils, but maximum yields are obtained only when calcium is adequate and the pH is 6 or higher. Adapted under irrigation or on dry land where the moisture equivalent is comparable to 26 inches or more precipitation. It is best adapted where summer temperatures are available throughout the growing season. 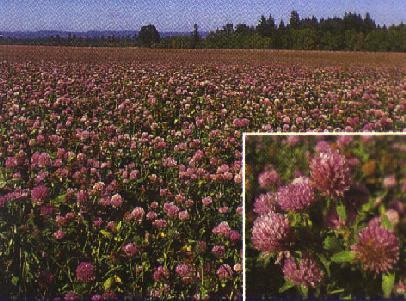 Red Clover can be used in pasture mixtures and for renovating old pastures. It is the easiest legume to establish in closely grazed or renovated sods. Rotational rather than continuous grazing will result in longer life of the stand. Grass should be included in clover mixtures to reduce the chance of bloat. The medium red variety produces two or three hay crops per year. It will return approximately 100 lbs. of nitrogen per acre to the soil. Longer lived than Kenland or common medium red. 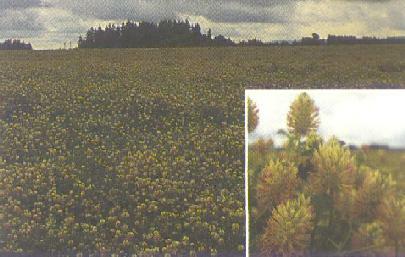 A long-lived perennial suited primarily for pasture, but can be used for high quality hay and silage. White Clover is an important pasture legume in most temperate regions of the world. It can be grown under irrigation or on dry land where the moisture equivalent is comparable to 18 inches or more precipitation. It is best adapted to well-drained silt loam and clay soils with a pH of 6-7, but is tolerant of poor drainage. It is not tolerant of highly acid, highly alkaline, or saline soils. White Clover has a prostrate growth habit, shallow roots, and will not tolerate drought. It can be used as a low maintenance growth cover for the home owner or public or private institution. It works well for lawn replacement or roadside ground cover. Large leafed, exceptional tillering, even under grazing. Has higher levels of non-structural carbohydrates. Long life. Primarily for pasture. Fine leafed. Produces high quality forage. Use throughout Western Hemisphere. A cool season annual, good forage producer, very susceptible to temperatures below 30 degrees Fahrenheit. Excellent re-growth and large leaves. A small creeping clover similar in growth to white clover, but needs continual moisture for maximum production of forage. Creeping clover. Pasture use. Southern adaptation.